Focus Features and ComingSoon.net are teaming up to give our New York readers a chance to catch a special free A Monster Calls screening at Brooklyn’s new Alamo Drafthouse on January 3 at 7:30pm! A Monster Calls is opening in limited theaters on December 23 before expanding wide on January 6, 2017. To get your tickets, simply click the Gofobo link below and be sure to show up early for the screening! 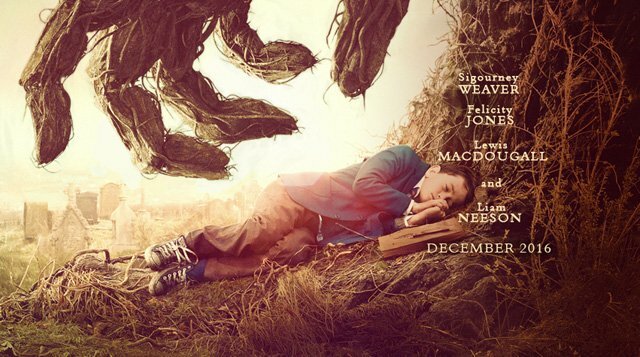 A visually spectacular drama from the acclaimed The Orphanage and The Impossible helmer Juan Antonio Bayona, A Monster Calls is based on the award-winning children’s fantasy novel by author/screenwriter Patrick Ness. The story concerns 12-year-old Conor (Lewis MacDougall) as he attempts to deal with his mother’s (Felicity Jones) illness and the bullying of his classmates by escaping into a fantastical world of monsters and fairy tales that explore courage, loss, and faith. The film also features Toby Kebbell (Fantastic Four), Sigourney Weaver (Avatar) and Geraldine Chaplin (The Orphanage). Patrick Ness adapted the screenplay from his own novel of the same name. The creative team on A Monster Calls includes production designer Eugenio Caballero, an Academy Award winner for Pan’s Labyrinth, who previously collaborated with the director on The Impossible, costume designer Steven Noble (The Theory of Everything), and cinematographer Óscar Faura, who shot both The Impossible and The Orphanage.